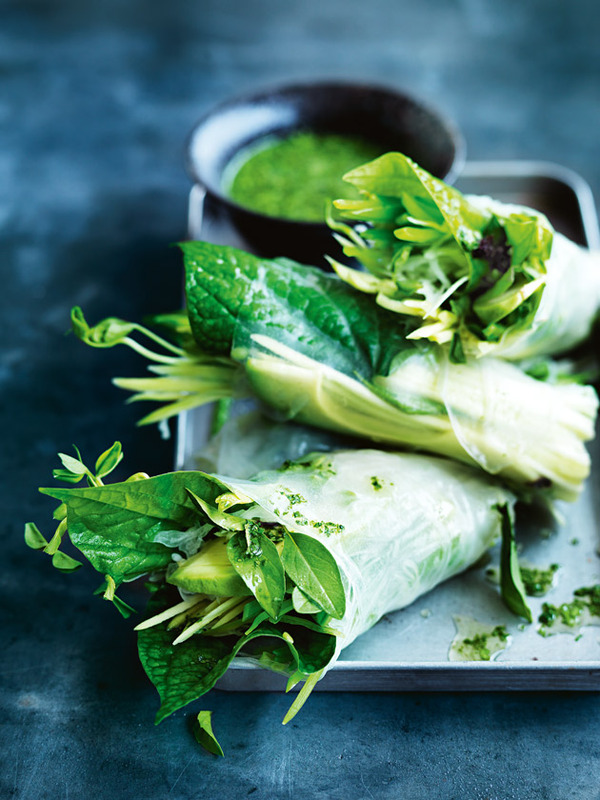 To make the coriander dressing, place coriander, chives, ginger, mirin and vinegar in a small food processor and process until finely chopped. Refrigerate until ready to serve. Dip 1 rice paper round in a bowl of cold water for 10 seconds to soften slightly. Place on a clean surface and top with 1 betel leaf, a little of the cabbage, green mango, snow peas, pea shoots, avocado and mint and basil leaves. Fold 1 short end over the filling and roll to enclose. Repeat with the remaining ingredients. + Find betel leaves and garlic chives in Asian supermarkets.